Is it possible to use a small combustion engine, just a few horse power, to turn a generator (also small scale) to simply supplement (provide a percentage of) the electric power needed to run an electric vehicle? My thinking is that the amount of weight for the small combustion engine and generator would be less than the weight of the batteries necessary to generate the same amount of power for the electric motor. I am also thinking that the throttle on the small engine can be synchronized with the accelerator pedal (throttle varies directly as pressing on the pedal with your foot). The engine would stay idling (providing a low amount of power until the pedal is pressed past a certain point (the throttle would only kick in after pedal has been pressed at least one-fourth to one-half acceleration or more, for hill-climbing or driving flat distances, respectively). When stopped at a light or stop sign, the idling engine would serve to recharge batteries. The engine would come on when the key is turned to connect batteries to controller, and would shut off when the key is turned again to disconnect batteries from controller. Optional switch to keep engine off if electric-only travel is desired, only using engine to recharge in an emergency situation (like no electric outlets around for miles). And this is in addition to any solar or other energy supplementation for the vehicle as well. Thanks. The difficulty, as you noticed, is that an electric vehicle accelerates, it goes up hills, and just generally operates in a state of variable load. The problem is that if you get a generator that is big enough to accommodate the higher end of your driving needs, it's way overkill for your low amp-draw, cruising along at constant speed driving times. It's running when it doesn't have to, and no storage place for that extra energy to go. If you get a generator that is small, as you indicated, or on the lower end of your driving needs, then you don't have the power to get you from 0-35 reasonably quickly. You don't have the burst of speed that would keep you from getting run over by the neighbor's Hummer. You don't have the juice to climb a hill. Batteries don't just store power; the symbiotic relationship of your motor's controller to the battery pack allows you to pull the right amount of power when you need it. So what do you do? You may have solved the problem of variable load with a throttle on your generator, and the only way to find out for sure is to experiment with it. It sounds like you're proposing a system which has a gas engine that has one purpose: to provide charge to run the electric motor which drives the wheels, and provide charge to fill the batteries. In other words, a series hybrid. That's certainly been done before. You want to run the engine nearly constantly to provide charge to a smaller-than-standard battery pack so you don't have to a) carry around all that weight; and b) keep running back to the wall to plug in. Problem with that is that your combustion engine is an expensive way to produce electricity, and the grid is a cheap way. You may have saved yourself some weight - that remains to be seen - but you're costing yourself money, noise, and pollution. The next stop on your road will be solving the problem of generators and other small-ticket motors being the worst offenders in terms of pollution. Alain St-Yves used a very small car engine (with all the legally-required pollution controls in place) to get past this difficulty with his Vehicule Vert. You might be able to think of something similar. There's probably a sweet spot where you can get all the things you want - long range, flexibility, economy, and low emissions - in one package. Experimentation by people like you is exactly how we find it. Keep up the good work! Comments for Can I Retrofit my Car into a Generator Hybrid? In the early eighties there was a hybrid electric guru in Missouri promoting just such a system. Published results in Mother Earth News. He was using starter/generator motors from jet engines and high efficiency diesel generators with a small battery bank. 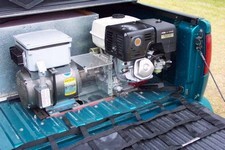 Generator was equal to average flat land ppower requirements and batteries handled the variations in power needs. The hard part was the controller pre computer drive. My own desire is for add on front wheel electric for my Toyota motorhome. Allwheeel drive and better fuel economy is the desire.. I have been considering this premis for a long time. If a diesel generator and motor can pull a friggin train, why couldn't it be done on a small scale with a car or truck? Or even a hydrogen powered generator? I've been unable to find a "how to" for that online, and the parts look as though they would be prohibitively expensive.. What say you?